The number of infant deaths and injuries attributed to crib bumpers has increased significantly in recent years, leading to new calls for a nationwide ban on the bedding accessory. Crib bumpers are padded cushions placed inside a crib to prevent a baby's limbs from getting stuck between the slats. According to a new study published in The Journal of Pediatrics, from 2006 to 2012, there were 23 deaths tied to crib bumpers reported to the U.S. Consumer Product Safety Commission (CPSC) -- three times higher than the average of eight deaths in each of the three previous seven-year spans. 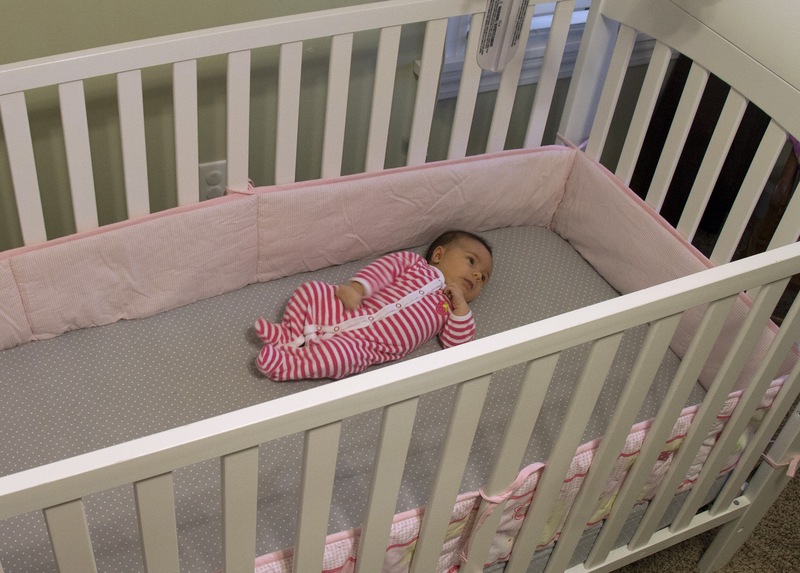 "Crib bumpers are killing kids," senior author Dr. Bradley T. Thach, a professor emeritus of pediatrics at the Washington University School of Medicine and the author of a 2007 study published that first documented crib bumper deaths, said in a statement. "Bumpers are more dangerous than we originally thought. The infant deaths we studied could have been prevented." For the report, the researchers reviewed CPSC data that showed 48 infant deaths from 1985 to 2012 were specifically attributed to crib bumpers. An additional 146 crib-bumper incidents were reported in which the babies nearly suffocated, choked, or were strangled. The average age of death was 4.6 months; the youngest was just one month old, and the oldest was 22 months. Furthermore, the examination of documents, including death certificates, autopsy reports, death scene and other investigative records, led the researchers to determine that 32 of the 48 deaths examined could have been prevented if the crib bumpers were not present. Most of the babies died from suffocation because their noses and mouths were covered by a bumper or got between a bumper and a crib mattress. "When a baby's nose and mouth is covered by a bumper, the infant can suffocate when his or her airway becomes blocked, or from breathing oxygen-depleted air," lead author N.J. Scheers, PhD, former manager of CPSC's Infant Suffocation Project, explained. "So if bumpers had not been in the cribs, these babies would not have died." The other 16 deaths, the researchers said, were attributed to the infants being wedged between a bumper and another object, such as a pillow or recliner used to elevate the babies' heads. They argue that if the bumpers were not present, the babies would not have been in this position and would have survived. The study authors also reviewed related data from the National Center for the Review and Prevention of Child Deaths that showed an additional 32 bumper-related fatalities from 37 states from 2008 to 2011. That brings the number of crib bumper deaths to 77, and suggests the actual number is much higher, the researcher said. The study showed that the deaths and injuries occurred with thick-pillow bumpers, as well as thin bumpers, which manufacturers have touted as being safer than plush ones. Bumper-related injuries were mostly caused by poor design. For example, near-suffocations occurred because there were no bottom ties, or not enough of them, which allowed the babies' faces to get trapped in the bumpers. Incidents involving choking and strangulation resulted from detached bumper ties and decorations, frayed ribbons, and loose stuffing. Despite the data and warnings of danger, crib bumpers remain popular. Major health organizations, including the American Academy of Pediatrics, the National Institutes of Health (NIH) and the Centers for Disease Control and Prevention have recommended against the use of crib bumpers. Currently, there are no federal regulations regarding crib bumpers, but the state of Maryland banned their sale in 2013 and the city of Chicago did so in 2011. The authors urge the CPSC follow their lead. "A ban on crib bumpers would reinforce the message that no soft bedding of any kind should be placed inside a baby's crib," Thach said. "There is one sure-fire way to prevent infant deaths from crib bumpers: Don't use them, ever."